Last week, we created a generic timer using canvas and the setInterval function. This week, we will add some audio elements and stylize the application using CSS3. This timer is going to have an optional ticking sound for each second that elapses and an alarm sound when it has expired. Adding sounds in HTML5 is done by defining elements with the <audio> tag. We’ll need to define a couple of them for our sounds without the controls attribute. Next we’ll add a helper function to play the sounds. Since the ticking sound is optional, users will be able to turn it off with a button that toggles. The last step for the sounds is to make calls to the helper function that we created. The ticking sound should be called from inside the setInterval function and the alarm sound will be called from inside the finish() function. Last week, we built the interface using a simple html table. This week, we have removed the table and now rely on CSS to position the elements. This gives us a bit more flexibility for the positioning of elements as well as the styling. And with a bit of CSS, our timer looks like the following. You can see the CSS for our timer by viewing the source of the demo, although I would encourage you to experiment with some different styles of your own. 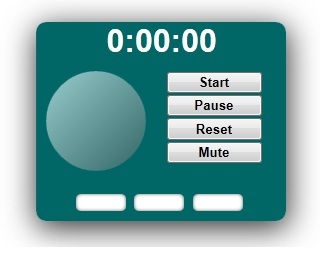 This week, we will be creating a functional timer using HTML 5 timer elements. For visualization, we will use the canvas element to visualize time elapsed as well as an overlay that displays a message when the time has expired. As a first step, we will craft the HTML for the interface. At the top of the page, we will display elapsed time followed by a canvas element the represents the elapsed time. You will notice that the canvas and has been wrapped in a container that includes the another div. This extra div will be used for an overlay message to be displayed when the time has expired. Next, we’ll add some input boxes so users can specify hours, minutes, and seconds as well as some buttons for starting, stopping, and resetting the timer. In our input boxes for hours, minutes, and seconds, we want to limit the input to integers. To do this, we’ll use the validate event and regular expressions. Now we will need to create the script that drives the timer. When the page is loaded, we will need to initialize some variables and render our canvas element. Notice the initClock function that is called. We don’t have that yet, so let’s create it. This function will be responsible for resetting variables as well as drawing the initial canvas element. At this point, all that is left to do is to plug in the buttons that we defined earlier. So let’s start with getting the timer running. This function will parse the user input for hours, minutes, and seconds and kick off the timer using HTML5’s setInterval function. The setInterval function will repeatedly be called until it is cleared, so we can take advantage of this to advance our visual representations. You should notice a call to an updateTime() function. We’ll need to create this function as it is responsible for the text display of elapsed time. Once the elapsed time has reached the limit, clearInterval () is called as well as a finish(). The finish() function is something we will need to create. Its purpose for now is to display some text in the overlay. Since we want our users to be able to pause the timer, we can attach the clearInterval() function to the Pause button. Finally, we will need to create a function for the Reset button. This function will stop the clock, zero out the elapsed time, and re-initialize the canvas. You can see the demo in action here. Next week we will add a bit a polish to the interface as well as add some audio indicators for interval updates and an alarm when the time limit is hit.